I know I'm bucking a trend here and going against the view of the dad-rock "experts" of the serious music magazines, but this album, like its predecessor "hours�", is a bitter disappointment. I am a huge fan of his three releases that preceded it, the soundtrack to the "Buddha of suburbia", "1. Outside" and "Earthling", as well as, of course, his classic work through the seventies. "heathen" and "hours�", though, seem to me to be the work of an artist who's run out of ideas. Others may acclaim how he's returned to the sound of his past, I see it as someone who was at his best tapping into the zeitgeist failing to do so. 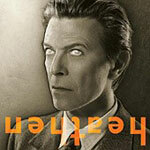 I had hoped we might see Bowie drawing on the sound of his Berlin period with this album, perhaps working with the nu-electro pioneers like Fischerspooner or Felix da Housecat, but no. Here we have a hodgepodge of mainly slow, pedestrian tracks with none of the emotional power of something like 'Life on Mars' and a severe lack of decent hooks to draw the listener in. And instead of the new electo-maestros guesting, we have dad-rock supremo, the Who's Pete Townshend, and grunge anachronism Dave Grohl. It starts off ok, with the slow build of 'Sunday', a track that wouldn't have seemed out of place on "1. Outside", before going off on an interesting tangent with the fetishistic lyrics of the grungy acoustics of the Pixies' 'Cactus'. 'Slip away' is a perfectly acceptable piece of pop whimsy, with the only decent hook of the entire album in its tribute to Coney Island chorus. From then on, it's Bowie by numbers, with barely even the hint of an original idea for ages. His cover of Neil Young's 'I've been waiting for you' is pointless and flat, not much of a tribute to the original. It's not until track 8, 'I took a trip on a Gemini spaceship' that we have the resurgence of some kind of playful creativity, a bit of an industrial-tinged electro sound with mad rambling lyrics, but it's a bit pass� really, not a million miles from 'I'm afraid of Americans' off "Earthling". Then its back to Bowie by numbers on the plodding '5.15 The angels have gone' and it meanders off unexcitingly to the end. It really is time to tell the Emperor that his tackle's in full view.